Biological atomism is a reductionistic intellectual movement that can be tracked to the popularization of Sir Isaac Newton’s corpuscular theories of matter and light in the late 17th and 18th centuries. The view held that in order to understand life, one must focus on what is believed to be the indivisible and elementary vital units of the cell, taking an epistemiological decompositional and/or ‘bottom up’ approach to understanding more complex processes. One of the great ironies of this reductionistic approach is that it necessitated the violent breaking apart of the object of study into smaller and smaller visible sub-units (e.g. vivisectionism), effectively killing (and greatly distorting the image of) the very thing it sought to understand, much like a young child may pull off the wings of a butterfly in order to satisfy his curiosity. After 400 years of the widespread adoption of this approach, the last half-century of efforts have fixated around the nucleus of the cell, and the genetic material therein, as the would-be holy grail of biology, and medicine is a byproduct of this movement. This effort could be considered to have run aground in 2003 with the completion of the human genome project, which failed to produce sufficient complexity and information in the ~23,000 protein-coding genes discovered to adequately account for the extremely complex interrelationships and behaviors of the 100,000+ proteins in the human body. For example, an earthworm has more protein-coding genes than a human. Also, if you consider that each second each human cell undergoes approximately 100,000 biochemical operations, the information contained within the protein-coding sequences of the human genome are vastly inadequate to explain the extraordinary feats biological phenomena articulate, from the paradox of protein folding (which requires proteins to conform to one specific native conformation out of a near infinite degree of freedom), to the bioenergetic discrepancies that exist between ATP* and the extraordinary energies required for the function of the cell, which may be 7,000 times higher than accounted for by ATP alone. In a nutshell, there is absolutely no way that the 23,000 protein coding genes contain the information needed to explain how the proteins within cells function. Today, a new view of the cell, and the body as a whole, is emerging that defines biological systems in terms of their networked relationships, and ‘open access’ ability to share and receive genetic information, and which connects all of life into a seamless super- or mega-organism, reminiscent of Lovelock and Margulis’s Gaia hypothesis. You also have the work of Rupert Sheldrake, Ph.D, who has proposed the existence of morphogenetic fields, which inform and co-ordinate the behavior of biological structures, but are not reducible to those structures themselves, and which have non-local effects not unlike what one observes in quantum physics. And the work of Jack Kruse, MD, who explains how the cellular bioenergetics of the cell take advantage of a literal lightning bolt of energy contained within the magnetic field strength of the mitochondria within our bodies, and which make possible amazing feats of energy and material manifestation, proving the cells have at their disposal abilities which classical physics and biology consider impossible due to their deference to the 2nd law of thermodynamics, which biological structures violate 24/7. Part of this intellectual transition away from biological atomism is a paper published in Trends in Microbiology, titled “How Our Other Genome Controls Our Epi-Genome”, which focuses on how our microbiome and information-containing molecules in food, known as microRNAs, participate in affecting the expression of our genome. 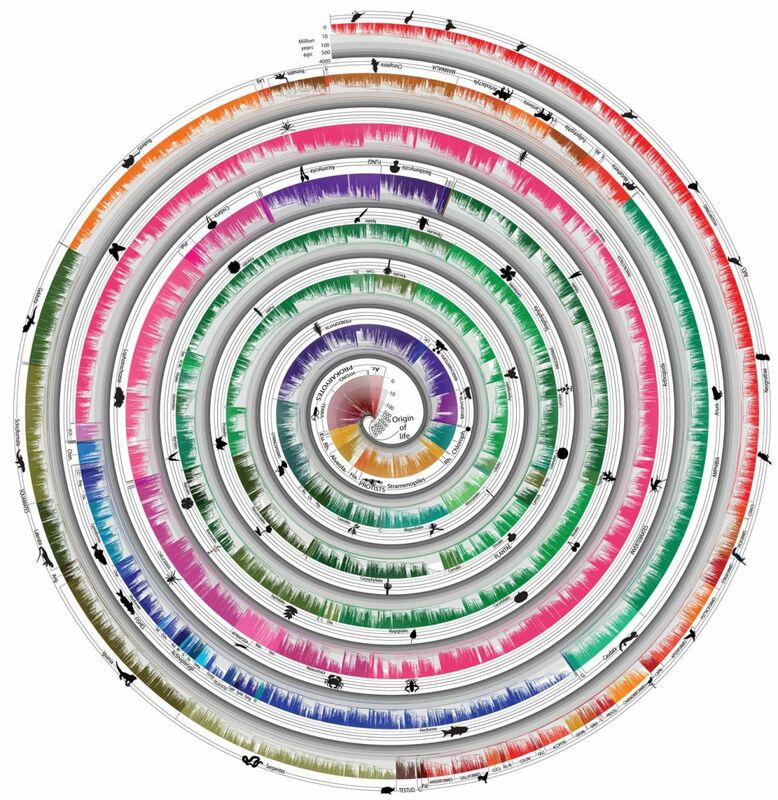 This phenomenon is also known as inter-kingdom communication, as it involves cross-talk and information sharing between bacteria and archaea (both prokaryotes), and plants and animals (both eukaryotes) such as ourselves — something which classical genetics and evolutionary theory did not believe was possible until recently. In other words, the traditional view is that the branches on the tree of life are supposed to keep various species within the kingdoms of life separate. If plants communicate with animals, fungi with bacteria, and so on and so forth, these hermetically sealed-off compartments dissolve, perhaps looking more like an open-ended spiral, as depicted below. The implications of this paradigm shift are truly revolutionary, and speak to a radical holism in life that hitherto was only discussed on the fringes of mainstream science. In this vein, the Trends in Microbiology paper explores how eukaryotes and prokaryotes produce extracellular nanovesicles that contain microRNAs and other molecules that they exploit for cross-kingdom communication. For instance, bacteria in our gut produce these microRNA-containing nanovesicles (about the size of a virus) called outer-membrane vesicles (OMV), which communicate with the cells of our body in a significantly correlated and co-ordinated way. For instance, the gene expression of our intestinal cells is generally co-ordinated to our gut microbiota composition. The relationship is bilateral, as there is ‘cross talk’ between intestinal cells secreting miRNAs and the bacteria that are affected by them, and vice versa. Emerging concepts like the gut-brain axis speak to this inter-connectivity mediated by bacterial OMVs and human exosomes, both of which carry and deliver microRNas. In other words, our genome is not only deeply affected by the microbiome via microRNAs and ‘cross talk’ between them, but food itself forms an essential part of this structure, connecting us in our species definition to the entire biosphere via all the plants, animals and fungi that we use as food. As I have discussed in previous articles, food contains miRNAs that are packaged in microvesicles known as exosomes, and which have been found to survive digestion and cooking, enter into systemic circulation within us, and affect gene expression. The implications of this are revolutionary, insofar as we can start to understand that food is more than just medicine, but that essential governing part of our health that also provides genetic and epigenomic stability to our species. That’s one reason why the absence of certain foods in our diet has at least as much to do with information deficiency as it does mineral and nutrient deficiency, and why we have focused on spreading awareness of the fact that food is a source of gene-regulatory information before anything else. This also means that GMO foods can dramatically alter (and disrupt) our gene expression in a way that risk assessments presently do not explore. What is this “new holobiont” of which they speak? Consider the traditional holobiont concept which introduced the radical idea that humans are “ecological units”, and are best defined as being comprised of all the species which inhabit it, including the viruses, bacteria, archaea, fungi, and even other animals like helminths, as part of its microbiome. But this view did not include vegetal or animal contributions of microRNAs, represented by our food. The authors therefore now provide this new holobiont in the form of Da Vinci’s Vitruvian man, which takes into account the interconnectivity discussed above by depicting 4 inseparable parts of our species: 1) human cells 2) human microbiota and other bacteria 3) Fungi and Viruses 4) Food. As you can see, because of the interconnectivity and “social networking” functionalities of RNAs packaged in microvesicles called exosomes, all four parts of this new definition of man become united in an indivisible whole. Because these RNAs packed in edible exosomes are epigenetically active, the food we eat “literally talks to our mRNA and DNA”. This is a truly revolutionary departure from previous concepts of what makes up the human. The addition of food to the human holobiont, while blurring lines between what is truly self and other, also connects us to the biosphere in an unprecedented way. Because most of the public still considers it simply a source of energy and building blocks for their ‘body machines’. In this new model, not only is it a source of information, but it has regulatory capacity on gene expression, not that different from or less significant than the other components. Given that they carry actual regulatory nucleic acids like miRNAs, which are known to target the expression of ~60% of the human genome 1, foods may be as essential to our genomic and epigenomic stability as our genes themselves. I think it is worth taking a moment to better understand this concept through a deeper exploration of the origin of Leonardo Da Vinci’s Vitruvian Man. The image (shown below) depicts a man inscribed in a circle and square in two superimposed positions with his legs and arms apart. Vitruvian literally translates to “the proportions of the human body according to Vitruvius”. Vitruvius (80-70 BC to 15 BC) was a Roman architect who considered the human body the principal source of proportions among classical architecture. The concept that the body, along with many other natural phenomena, contains proportions and geometries found in the universe as a whole is already established in the Fibonacci series, also known as the golden ratio (a series of numbers in which each number [Fibonacci number] is the sum of the two preceding numbers. The simplest is the series 1, 1, 2, 3, 5, 8, etc.). From fingers to faces, flower petals to seed heads, pine cones to galaxies, the pattern is the same. The idea, of course, relates to the age old concept that “as above, so below”, or the quasi-holographic idea that the part reflects the properties of the whole. Previous to the discovery that there is horizontal gene transfer and reversibility of information flow in cells from the outside in (environment > nucleus), the reductionist view of biological atomism precluded there being a mechanism to connect the part to the whole. Now we see that the kingdoms of life are no longer hermetically sealed off in endless competition with one another. They participate with and in one another, in a type of network which speaks to the oneness and openness of life as a whole. The study, with its unforgivably long title, “Possible role for microRNAs as inter-species mediators of epigenetic information in disease pathogenesis: Is the non-coding dark matter? of the genome responsible for epigenetic interindividual or interspecies communication?“, identifies transcribable elements within the so-called “dark matter” of the genome (the about 98.5% of the genome that does not code for proteins) known as non-coding RNAs. One kind of non-coding RNA identified in the study, known as microRNA, is believed capable of acting as a master regulator of gene expression across kingdoms. Produced by bacteria, fungi, plants, and animals, microRNAs are capable of surviving digestive and assimilative processes intact, entering the tissues of these organisms and affecting the expression of a remarkably wide range of genes (approximately one third of our entire genome). If microRNAs indeed function as cross-kingdom master regulators of the diverse members of the biosphere, every living thing is therefore inseparably connected via inter-penetrating webs of genetic and epigenetic relationships. This perspective radically diverges from classical evolutionary theory where organisms are viewed externally related to one another, with self-preservation and survival — not co-operation — as its primary organizing principle.